Finn was born a blogger's child, and that comes with responsibilities. He didn't seem to mind too much having to visit a baby spa though, in fact he seemed completely in his element. Picture fresh white walls, a feeling of calm as soon as you step through the door, relaxing music and a warm welcome from Laura Sevenus, the owner and an infant swimming expert. The Baby Spa is the kind of place you can picture celebrities and is located in an exclusive Kensington postcode. Finn seemed to feel at home as soon as we arrived, and he certainly took well to life as a pampered baby. Having three under fours, I am not allowed to take the boys swimming on my own, so this was Finn's first time in water other than the bath, and the Bubby was unlike anything I have seen before. 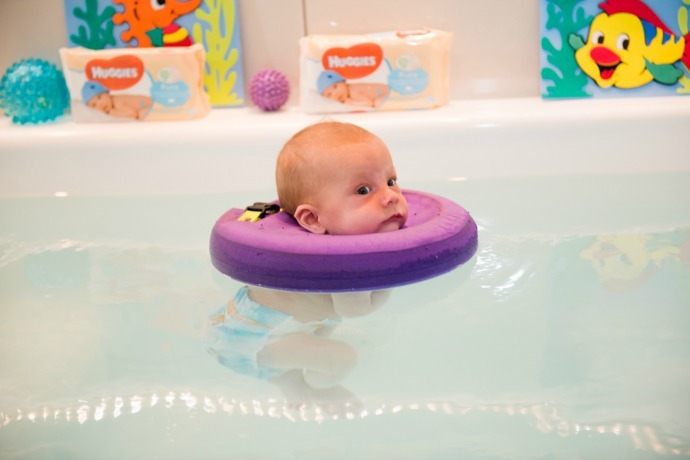 A patented floatation device that looks like a donut around their neck, it allows babies to float and stretch out whilst remaining safe. I have a baby with a very ticklish neck, so putting it on wasn't so easy, but I could see his body relax as soon as he slid into the water, and he floated around looked relaxed and content. The pool he was in resembled a small hot tub, and there were smaller pods for the youngest babies along one wall. You could see everything through the clear, purified water and I loved watching his limbs stretch out and propel him closer to whatever he wanted to look at. The spa is suited for babies from newborn to 6 months old, and I can really see how it would benefit a brand new baby as well as being an amazing experience for an older one like Finn. His floatation experience ended and he was taken for a massage with South African grapeseed oil. Again, Finn lay there totally calm, taking it all in, alternating between watching the mobile above his head and giving the biggest grins. All this pampering is utterly exhausting - stretching out like he did is a complete workout for the dinky one, and he needed a good rest afterwards. There is a special room for this, with sleeping pods to lay baby in whilst us mamas can relax and have an Indian head massage - it felt fair that after Finn had had such special treatment it should be my turn! 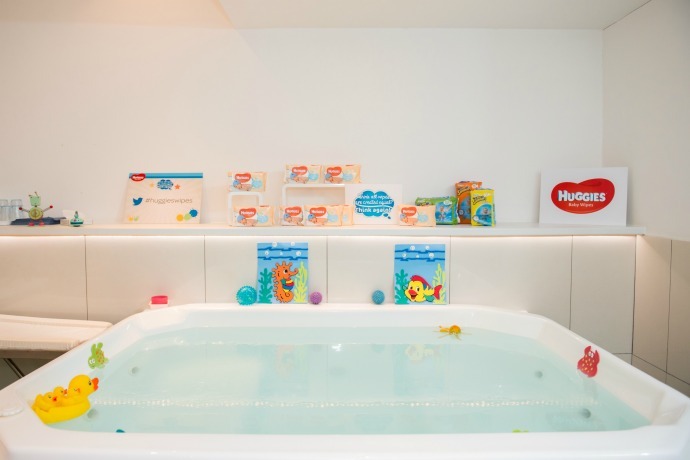 The reason we were at the spa, was the relaunch of Huggies 'Pure' wipes. We chatted to Midwife Natalie, Dertmatologist Emma and health visitor Jayne about the improvements Huggies have made, and how the new formulation which is now alcohol, paraben and phenoxyethanol free is suitable from birth. I used cotton wool and water with all three in the early days, but it wasn't easy to stick with it for long and knowing that you are choosing wipes that are as gentle on your baby's skin is very important. 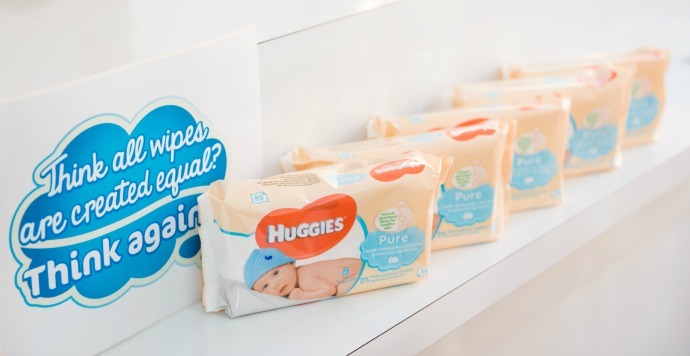 Huggies Pure wipes are a staple in our household now, and I use them for the boys and for taking off my make up too - We have a pack in every room just in case! They don't leave an oily residue and the natural fibres are kind to skin, both newborn bums and twenty something year old faces. Becoming a Huggies Wipes Ambassador has made me realise how little I knew about what I was putting on my baby's skin, and I now feel much more informed, and happy that these wipes are so pure they are suitable from birth. We would love to return to the baby spa, not just because Finn was so happy and relaxed whilst we were there - the effects lasted a good 24 hours, with him taking 5 naps over the course of the day and still sleeping all night! Thanks to Huggies for a fantastic day out.